In the second of a pair of shipping announcements this week, Extron Electronics announced the immediate availability of their HC 404 Meeting Space Collaboration System. Originally launched a few weeks ago by the audio visual and collaboration space specialists, the HC 404 is a system that extends control capabilities to Zoom Rooms. 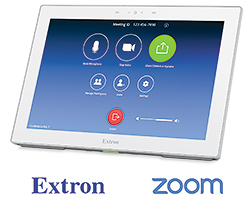 According to Extron, in fact, it provides a one-touch user experience for conferencing, collaboration, and AV room control. That means that all audio visual and conferencing functions within a collaboration can brought under one umbrella. All that’s needed to control and customise them is a single interface on an Extron TouchLink Pro Series touchpanel. The HC 404 is easy to use and able to be leveraged in a number of different installation environments. It combines video switching, scaling, signal extension, and system control into a transmitter and receiver pair that seamlessly integrates with a variety of room configurations. That allows the system to automate common functions, such as display power and source switching. It also lets users quickly share projects by simply connecting their laptop, tablet, or other source device. If you would like to discuss your requirements for Extron audio visual or collaboration solutions please call us on 0800 195 4825.